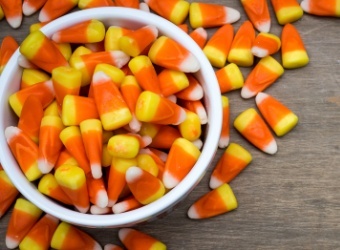 How Much Halloween Candy Should You Buy This Year? You just might end up spending more money on Halloween candy this year that you did last year. Americans are likely to drop $2.7 bilion on candy this year up from $2.5 billion in 2016, according to the National Retail Federation. You’re not alone if you’re feeling like buying more candy this year than you did last year: Spending on everything having to do with the holiday is expected to set a record. Actually, 95% of shoppers surveyed by the National Retail Federation said they intend to buy candy this year. You could plan on budgeting roughly $35 in candy spending for every 100 kids you expect to give treats to — but that assumes you’re not giving any to adults. A more throrough approach to planning your candy spending night be based on how many trick-or-treaters who came to your home last year, since Halloween also occurred on weekday in 2016. However, if you’ve moved over the past year, you might need to suss out whether your neighborhood has the same level of trick-or-treating activity as your previous location — especially if you relocated a considerable distance or if you changed from city to suburbs (or vice versa). Other factors to consider: How generous do you feel like being this year? Did you have more candy left over last year than you would have preferred? Are you hosting a party or attending any where you wish to serve or bring candy? As for what kind of candy to buy, you don’t have to leave it to your own whim or even guessing when you can go with what’s already popular in your state — the interactive graphic beneath this post show the top three candies in each state based on 10 years of sales data compiled by CandyStore.com. After you look at the data here, then it’s a matter of searching for this year’s prices for the sweets that are most popular in your state. Readers, what are your shopping plans for Halloween this year?